BrainBrix is a new type of brain teaser, which differs from all other well-known types such as Sudoku. The basic rules are easy to follow: There is only one rule! The classic brain teaser consists of groups of seven honeycomb-shaped blocks. Each of the blocks holds a number and all numbers from 1 to 7 must appear once in every group. The illustration shows a completed group. The numerical sequence as well as the positioning in lines, columns or diagonal lines is not important. How can such a simple rule produce exciting and challenging brain teasers? The special characteristic lies in the way the groups are laid out within the exercises..
To solve a brainbrix challenge you will continually have to re-orientate yourself, as the overlapping will cause your attention to continually roam from one group to another. You have to determine which numbers are missing from a group or excluded by the overlapping. 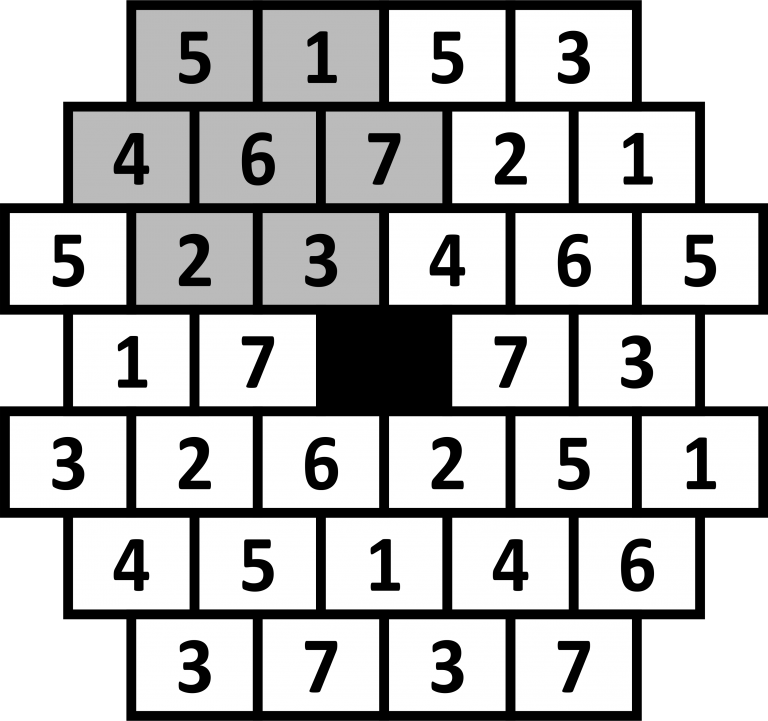 Which number is missing from the empty block? The teaser contains two overlapping groups (A and B). Group A is complete and contains all of the numbers from 1 to 7. One number is missing in Group B. If you look at the numbers in the blocks in front of you, it can only be number 7 that is missing. Several empty blocks are shown in the following teaser. It also consists of five groups. 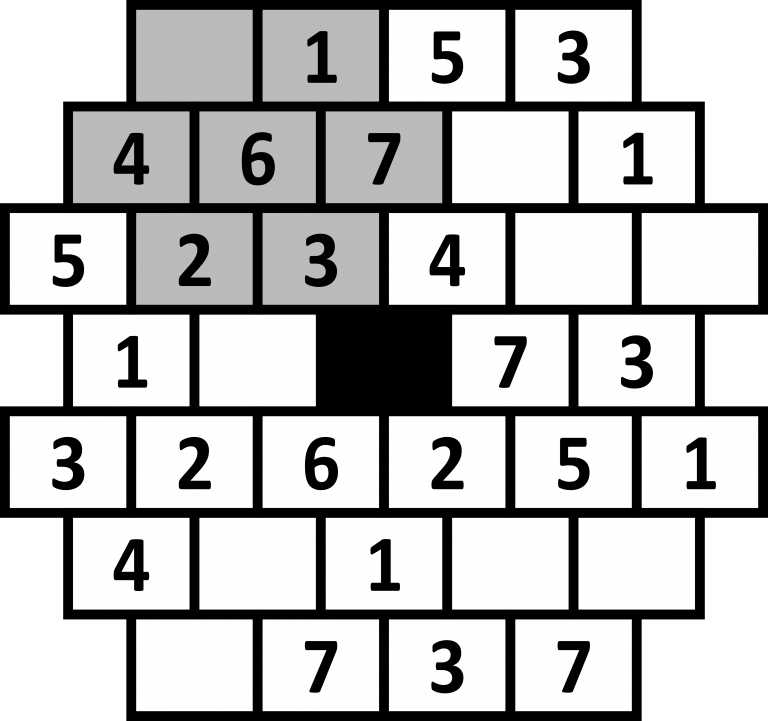 Which numbers are missing from the empty blocks? A few numbers aremissing in many of the groups, but you cannot complete the groups immediately. Number 1 is shown on the right in the third line and this belongs to the group at the top on the right. This tells you immediately that it cannot be a 1 that goes in the empty blocks in the second and third lines. There isonly one cell left in the top right group: the first cell on the left at the top. Alternatively, you could start with the group on the right at the bottom. There is only one number missing here and this will help you to complete the other groups one by one. The introduction provides a short video to introduce the main features and rules.